Some people (kids) think that the refrigerator is a magical place that keeps food fresh forever (or at least until mold forms). 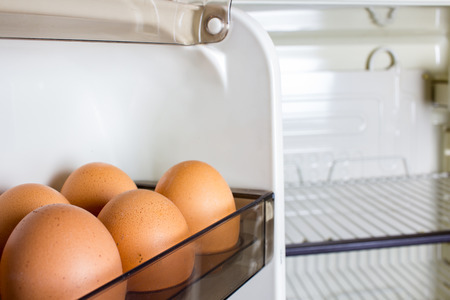 The refrigerator door is the best place to store nonperishables like sodas, not eggs. Other people (moms) fanatically toss things out after a day. Who is on the right track? Essentially no food benefits from storage. You want everything as fresh as possible. Since we can't all tromp out to the garden to harvest produce for each meal, here are some guidelines for making your fridge function at its best when it comes to food storage and safety. Some parts of your refrigerator are colder than others. The meat compartment at the bottom is designed to store meat - so put meat there. Not only is this the coldest area, but if the package leaks, it won't contaminate other foods. The door is the warmest part of the refrigerator. This is the best place for nonperishables (sodas), not perishables (eggs). To keep food from spoiling in the refrigerator, the temperature needs to be between 34 and 40 degrees F.You can't depend on the little gauge (1 - 5) in the refrigerator. You need to buy a a refrigerator thermometer. Ditto for the freezer, which should be kept at 0 to 5 degrees F.
Don't put hot food in the refrigerator. Bring it to room temperature before refrigerating it. Hot food can cause refrigerator temperatures to drop. On the other hand, don't leave food out too long either. Refrigerate prepared food within two hours of cooking (one hour in the summer). Don't overload the refrigerator. Parties are a dangerous time because we cram a lot of stuff into the refrigerator and then we're continually opening the door. Turn the temperature down during these occasions. Leave meats in their original packaging to prevent spreading bacteria. Don't store breads, cookies, or most cakes in the refrigerator. They will become stale quicker. If you lose power, do not open your refrigerator or freezer. If the door is not opened, food should keep eight hours in the refrigerator and 48 hours in the freezer. Mark the date on foods when you put them in the freezer. Clean your refrigerator once a week. 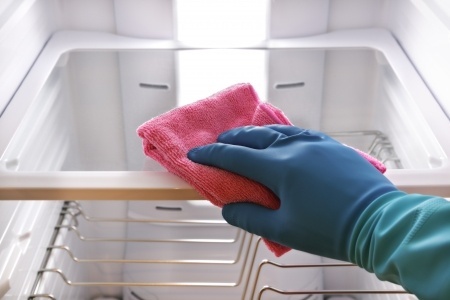 Wipe up any spills in your refrigerator immediately to keep bacteria from growing. Wash first with warm, soapy water, then disinfect with a solution of 1 teaspoon bleach in 1 quart water. Clean your refrigerator once a week, and toss out old foods. 6 How Long Do Foods Keep? Refrigerating food helps keep them fresh, but they still won't last forever. How long is chicken good for in the fridge? How long can meat stay in the fridge and safely be eaten? Fresh vegetables: Ranges from 2 days for soft veggies like asparagus or okra to 2 weeks for hard vegetables like radishes or carrots. Pies: 1 to 2 days. Best advice: When in doubt, throw it out. A little thriftiness is not worth a tummy ache.